In nineteenth century Norway, people had a given name, and they had a second name formed from their father's name, appended with "sen" for a male, or "dotter" for a female. They often were referred to by a third name, identifying where they lived. Thus, John whose father was Erik, and who lived in Borsa, might be known as John Eriksen Borsa. John Eriksen and Alet Andreasdotter, and Klemmet Pederson and Anne Paulsdotter, were two couples living in the Skavdahl Valley of Sor Trondelag, Norway, in the early part of the nineteenth century. The son of John and Alet, Knut, married the daughter of Klemmet and Anne, Kjerstin, combining the two families. Many descendants of these families remained in Norway, and many emigrated to North America. The objective of this site is to record the descendants and ancestors of these two couples. 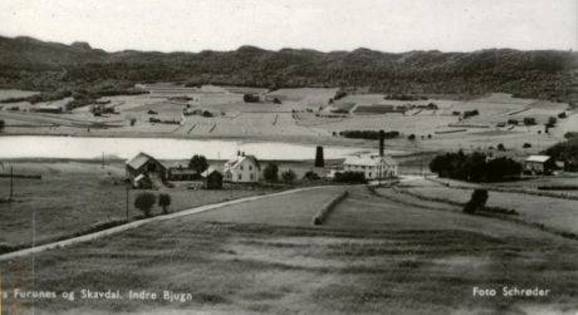 Below are two pictures of the Skavdahl valley, which provided the name for the members of these families who moved to North America. We believe there is a third Skavdahl family in North America, not related to these two families. This index provides access to information about descendants of John and Alet. This index provides access to information on descendants and ancestors of Klemmet and Anne. Return to Bowyer home page.